A drop in the bucket…. Greetings from beautiful Guatemala everyone! Wow, have we really been here for over 2 1/2 months? Must be true because we are off next week on a furlough to Costa Rica for 72 hours. We travel here on visas that are only valid for 90 days and you have to leave the country to renew. The alternative is to pay a hefty fine at the end and risk refusal to re-enter next year. So off we go! I am sorry I haven’t written a blog in a long time. There are various reasons for this… firstly I was completely snowed under by my University work for the first 2 months here. Back in Canada I fell behind… seems ‘stuff’ really gets in the way for me in Canada. I am all caught up and have only some cases studies to complete now over the next 2 months…. then my exam in June. God willing, by July I will be a RHN (Registered Holistic Nutritionist). I cannot tell you how invaluable this will be to what we do here. People do not know how to eat to maximize nutritional intake on what can laughingly be called a ‘tight budget’. Also with no money, comes no medicines to cure what ails them. Its incredible how much has been provided to us in nature to cure us. This is what I will be doing on a full time basis here. To say I am excited to get started would be the understatement of the century. Another reason I have not written a blog until now…. well honestly, I haven’t much felt like it. This year, as opposed to previous years has been incredibly tough. We have a family that we have been trying to help for the past 2 years that is just impossible to help. You have to understand that sometimes here it feels as though we have 100 dependents. I know that others are not our responsibility but in a way, by default of what we do, they are. And lets face it, some families are just easier to help than others. This family has had all of their kids in the hospital at one time… some several times…. one has already died…. all because the parents are separated… and to be totally frank, they are irresponsible. The children are not cared for in the slightest…. and we fear for them every day. But Guatemala has no FACS (Family & Children Services) like back in Canada. 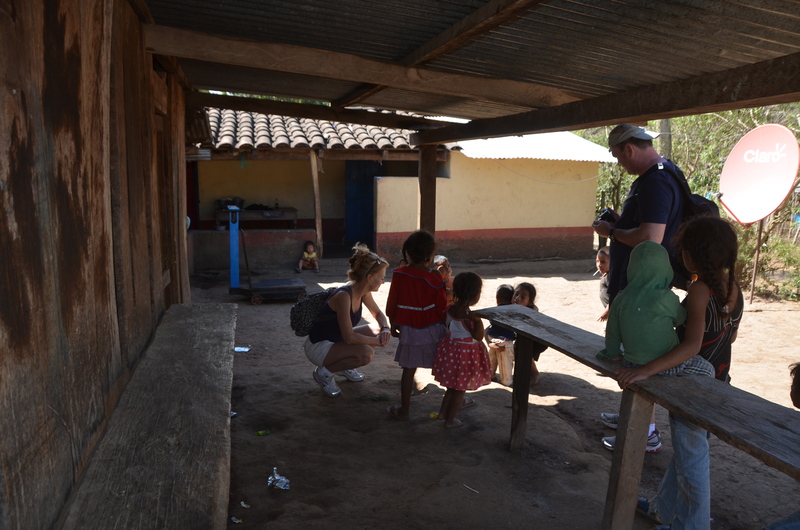 So we jump through hoops trying to figure out ways for these children to get help. But at every corner we are blocked by the adults in their lives. We bring food… the adults eat it… We had plans to build them a house, but we fear the adults will take it over and the young ones will be left out in the cold. We visit this mountain family 3 times per week and the situation seems to be more desperate each time. The kids are hungry, sick, dirty and neglected…. The adults are healthy and vibrant…. You getting my drift here? This situation has reduced each and every one of us… and some of our volunteers, to tears at times. We all just want to help so badly… but are at a loss at what to do. Hermana Mercedes has tried psychologists, sequestering the children at the hospital… but all to no avail. So needless to say, a feeling of hopelessness has overcome our little community here at times. We have all grown so close to these kids…. Everardo, Jakelin, Yeimi, Gabriella, Esdras, Moises etc etc…. there are so many…. so sad. Today Abram visited the hospital with his mom. Abram is from a different family. He was in the hospital last year and we all became very close to him. Today he arrived for his monthly visit, check up and meds. He looked so incredibly healthy. Thank God for the Hospital Infantil! Thank God for parents that care enough to help keep their kids healthy! This is the way it is supposed to be!!! Please keep this family in your prayers…. and us, that we along with the Hermanas can come up with a viable solution before its too late and we lose one of them or more… God Bless them. So…. suffice it to say, we are struggling this year…. emotionally. And when I struggle, I do not write… and if I do, I certainly get way too morbid for even my own taste, and thus I avoid. Its just who I am. Today however, I am writing. Today, was a great day! A day of renewed hope! We formulated a maybe-plan for the family that might just work. I won’t say too much yet about what it is until I begin to see it come to fruition. But suffice it to say, today after meeting with the Hermanas we may just see some light at the end of that proverbial tunnel. We also met with Manuel this afternoon. Manuel came to us last year, armed with a note. I will never forget what it said…. “ I am a man of limited means….. I cannot write but had a friend help me…. I do not want a hand out or money….. I want a job…. I am a hard worker and will learn anything.” I remember the exact moment he handed us that note after waiting patiently almost 4 hours for the opportunity to speak with us after we finished work for the day. Manuel did get work from us. He worked hard, was early every day, and never missed a moment of opportunity to help us any way he could. He even took a good portion of what he earned and bought and prepared a lunch for all the other workers on the last day of the job. He is an incredible man, with an incredible heart and he is our friend. Our meeting today was to see how we could help his family and to see if he wanted work for this year. Yes he wanted work…. no he didn’t want us to help him. His reasoning? Well, he said that there are so many people out there much more poor than him and he never wanted to take anything away from anyone else in need. He went on to tell us that he and his family prayed every day for our family and all the other Canadians… that God would bless us, so we could return to help the poor of his country. He also wrote his name and phone number on a paper for us! He is learning to write!!! I am telling you, I love this man. We all do. He is so humble and amazing. He will be helping us this year…. and we WILL be helping him. There has to be 20 people living in his 2 room house that is crumbling. Since we have decided not to build homes this year, unless there is an emergency situation we will help him in other ways. Mainly by building him a roof like structure. The thing that struck me today…. after talking with Manuel for almost an hour…. asking over and over if he needed anything… (a question he refused to answer), he finally did come up with something… he pulled us aside and whispered to Zack…. he needed 100Q for his son to continue going to school…. and later he asked for 50Q so his other son could buy a hen for food…. he whispered because he didn’t want his sons to know…. Want to know how much 150Q is…. $19.00. We gave this man 19 dollars and it changed his 2 sons lives. How incredibly simple…. How do we drop $19.00 on trivial things back in Canada. Sorry to pick on Starbucks but I’ve dropped more than that on 2 large coffees and a scone. I can assure you I won’t be doing that anymore. One thing being here does to me is helps me to be much more aware of my money and how just a little can go a long way for a family in need. 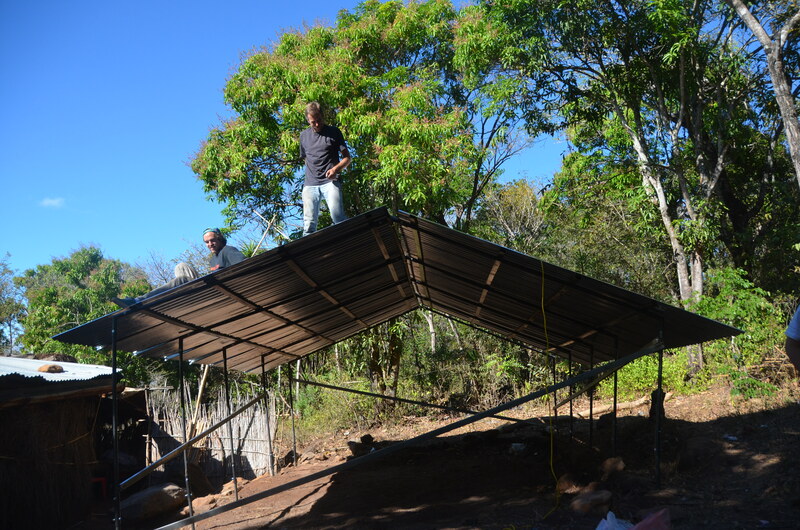 Now, about this roof structure… exciting times… one night, Geoff, Jamie, John and Zack (Jamie & Laurie and John & Helena were our most recent volunteers) sat outside at our plastic dining table and came up with a plan. An amazing plan of a pre-fab roof that can be put up in a day. 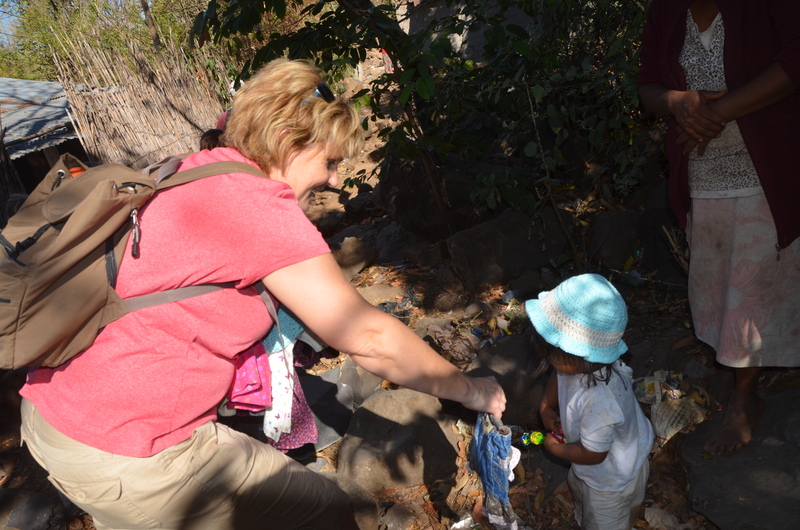 There was a woman, Miriam from last year that we had promised to help when we returned this year because last year we were out of time and money…. This lovely woman and her family were our first trial of this roof structure. It went amazing! Geoff, Jamie, John and Zack, Luke and Gabe put it up in 1 day with some finishing touches the next day. 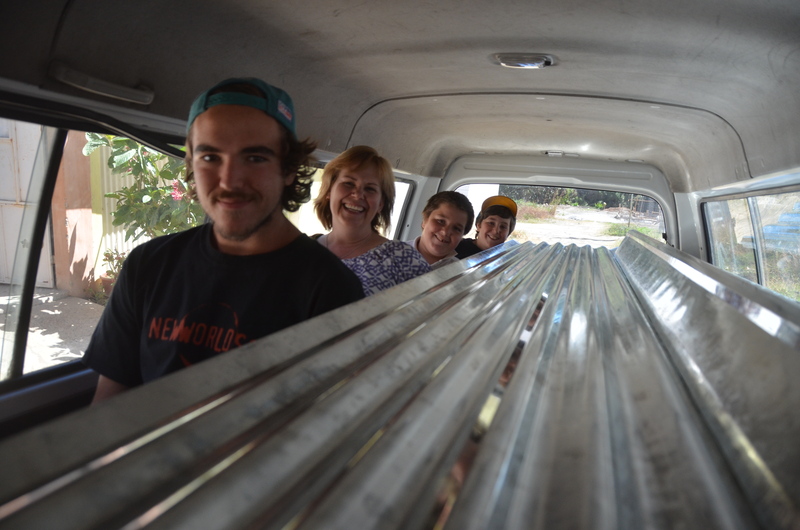 It was all pre-fab and welded in the courtyard of our home by some Guatemalans and its awesome. Its not a house but its a structure that will keep them dry and warm in the rainy season. One can attach walls of rock, adobe mud, bamboo, metal lamina etc etc.. virtually anything! 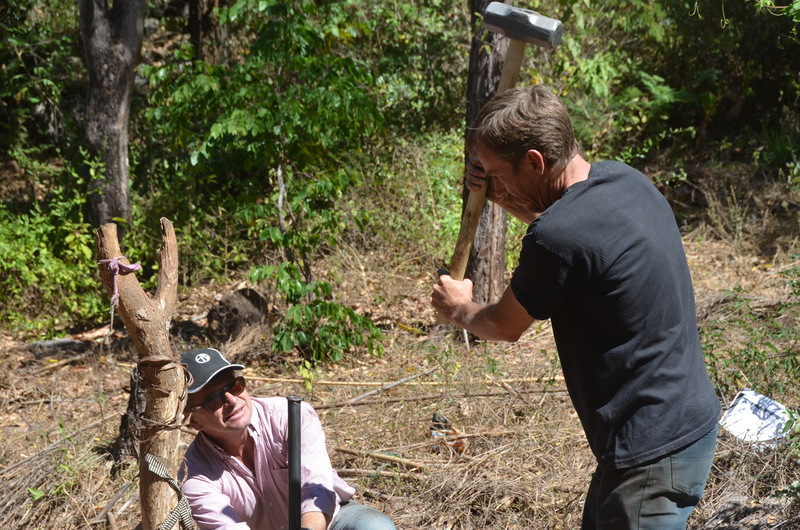 Our plan is to teach Manuel how to weld and employ him to make them for us for use in the mountain villages. We also have quite the plans…. It always strikes me as funny how things change and how diverse we have to be. We have begun a pig farm with plans to expand. This will provide food (via pork) for the hospital AND money from the sale of the pigs. 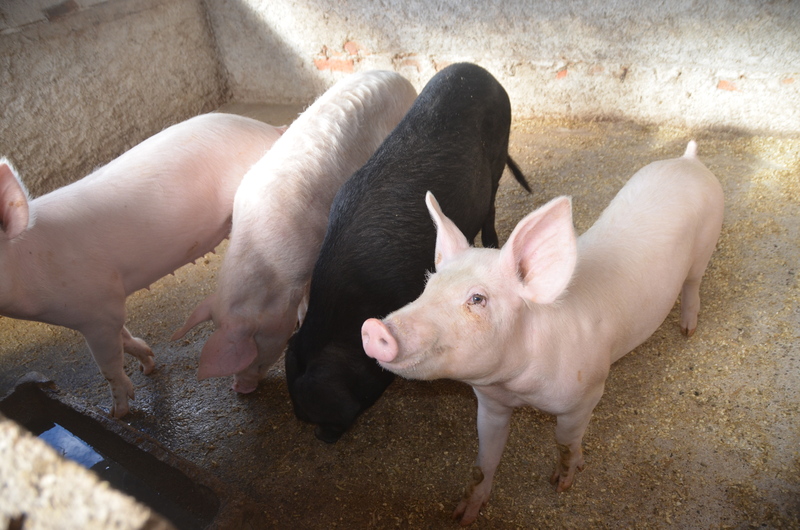 We hope to have 40 sows producing babies year round! At the moment we have only a few and need more. We also (thanks to John & Helena) now have 2 cows!!! Thelma and Louie. A boy and a girl that hopefully will be producing baby baca’s (cows) within 6 months! Again for meat and sale. If anyone had ever told me that we would be basically farmers down here…. I never would have believed it! Our plan for the farmland crops is on hold for now. The market here is terrible for anything produce… even coffee (tell me please, coffee shops in North America, how Guatemalans are getting only 10 cents per pound of coffee when you charge so much?). 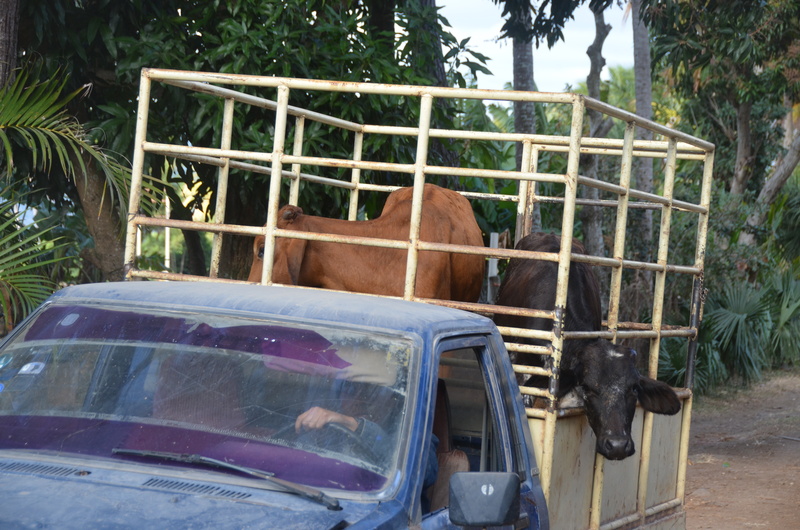 Guatemalan’s have lost money… a lot of money in crops, so the land here right now is much better used for cattle. Thus, we are adaptable. Cattle it is!!! I have to say, I have never been more proud of my boys…. they really have stepped up to the tasks here in Guatemala. Zack is our translator now and is loving the farm life. Secretly I think he was made for this…. It will be interesting to watch him grow and thrive over the coming years whether here or in Canada. He is 18 now and has many decisions about his future ahead of him…. But he has shown such growth in these past few months into a young man that Geoff and I are so proud of. He is actively a huge part of the decision making process here and has some fantastic input. Nothing like the mind and thoughts of the young to get things going! Luke and Gabe are also maturing…. its awesome to me to see their hearts and minds grown and work… when I think back to what I cared about at their age …. wow, they are incredible young boys and I am confident they will grow into incredible men… all of them! They have an incredible role model in Geoff…. God truly blessed me with the men in my life! I love them so much and its such an honour to serve here in Guatemala at their side. So there you have it… the life here. Its trying at times but good. Volunteers have begun to arrive and we have said some ‘good-byes for now’ already. Overall its an amazing privilege to do what we do here. Even though its very hard at times…. The biggest obstacle as always is money. We have many things going on to help, but we cannot do any of it without you. We need money for pigs, more cows…. money for materials for the pre-fab roofs…. money for the hospital and the kids for food, medicine and education…. Pick something that touches your heart and visit our website www.thedoppenbergs.com to donate now so we can continue to do what we do…. maybe even consider coming down and seeing for yourself!!! We promise it won’t be boring… just ask anyone who has come before! We have “Highs and lows” that traditionally accompany our after dinner talk. One night after an especially trying visit to the family we are struggling with, emotions were running high. Helena mentioned a quote by Mother Teresa. Apparently when Mother Teresa was asked why she would continue when its so little and the need is so large she said…. “We ourselves feel that what we are doing is just a drop in the ocean. But the ocean would be less because of that missing drop.” Helena likened it to a drop in a bucket….. Thank you Helena for that…. We feel we were given this beautiful bucket by God. So this is our bucket…. and we need you to help us put some drops in…. The bucket is large….. but it gets filled one drop at a time. One drop at a time, together, we CAN make a difference! Trish experiencing how sometimes we have to come up with creative ways to transport materials…. Geoff and John putting together the pre-fab roof on site. Posted on January 23, 2013, in Guatemala Missionary, Uncategorized and tagged celebrate life, friends, grief, Guatemala, Hope, Malnutrition, mission, Missionary, Volunteers, World Impact, Youth. Bookmark the permalink. 2 Comments. Lovely Rita. Totally understand the frustration, and applaud the perseverance. Keep doing the stuff…Love you guys..